thanks to a witness I am tracking down the person who practiced their parking skills alongside my car. I have now made all of the Hour Glass Blocks needed for this quilt and have sewn the blocks together into strips. 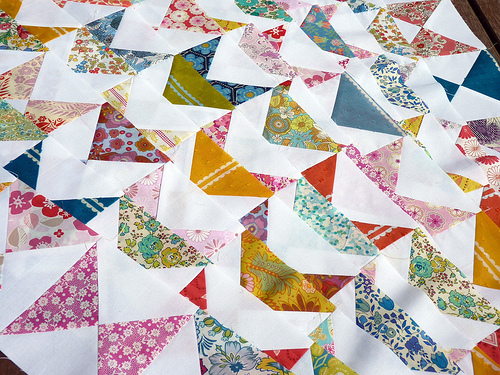 Hopefully by the end of today the rows will all be sewn together into a quilt top. Sorry to hear about your calf - hope it heals quickly and well! I can commiserate about the pantry moths. I have had recurring pantry moths in the house I recently moved into, they are such a pain! The quilt looks pretty, though. Next three wonderful things will happen! And as always, the quilt looks beautiful! Ooch!! That sounds painful. Thank God you can still sew! BTW - your hourglass blocks look like little kitty faces the way you have them lined up. Hmmmm. Another block idea! An injury and school holidays are a perfect excuse to devour those books - hope you enjoy, I certainly did, and liked the movie of the first one that we saw recently. It's in Swedish, with subtitles - done well, we thought. The hour glasses are gorgeous. I too have had the pantry moth problem in the past... and had to throw nearly everything out. What a pain! 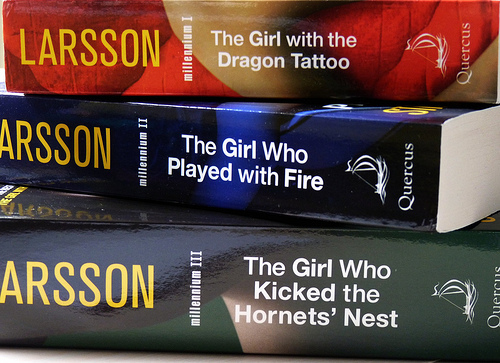 I am onto book 3 by Steig Larson at the moment... I know that when I read NOTHING else will happen until the book is done. It's an addictive series, and the movie of the first book was good too! aren't pantry moths the worst? Horrible little buggers. The traps sold at woolies and coles work really well. I'm reading the girl who kicked the hornets nest having ordered it from UK. (no US release until summer) Can't put it down and I might be cranky from lack of sleep tomorrow-ahem. Ouch! I'm three months in to two blown knees, so I know your pain. I've read (listened on my ipod) the first two books and really enjoyed them. Didn't know about the 3rd--can't wait for it's release. Sorry about your calf - sounds very painful. Hope it heals quickly. As always, love your quilts. Hope you heal quickly! Looking forward to your beautiful quilt! Oooh those books are awesome and there is a movie to the first book out. If you like subtitles in Swedish then go and enjoy. Good luck with the injury and car tracking. I loved those books! Hope for a quick healing! 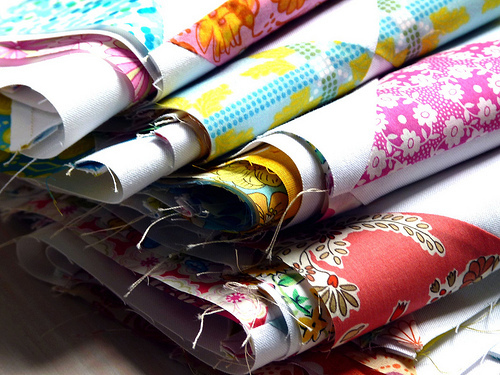 Lovely blocks and beautiful fabric, Rita - it hope it does help to have something beautiful to look at! Wow, your calf, your car, your pantry! Gee, I hope the rest of the week shapes up well for you. The sewing definitely softens the blow of all the other things happening. It is a lovely quilt in the making. Feel better soon! Expect to have much less time for sewing and blogging until you finish the Millenium series -they are great. And I'm pleased to hear it's not just me with moths in the pantry - they are driving me crazy! Hope you feel better and you are so lucky to have a KINDLE!! I like the quilt! I just Love this!!! Are you able to tell me the size of the blocks/triangles? HOW did you get "The Girl Who Kicked"????? My library says it won't be here until the summer. I'm so jealous you have The Hornets Nest...it won't be out in the states until May. I hope you heal quickly! oh no glad you can still sew! because that would be the end of the world really!!!!! we had really bad pantry moths when I was pregnant with keira and in our flat, oh dear it was bad so I feel your pain! I invested in 50 million modular mates from tupperware and have to say we've never had moths in the pantry since! Hope your calf muscle is feeling better. Don't you just love having teens home?! :) Enjoy the weekend. The Quilt looks Great..Sorry to hear of all your mishaps..hope you recover soon. School holidays are the best despite the teenagers. No early starts and no lunches. Besides mine never wake up before 12noon. I have the moths too and despite the massive clean out they are still fluttering around. 4 words - I hate pantry moths. A few more. Sorry about your calf and car. Hope you have lovely school holidays. 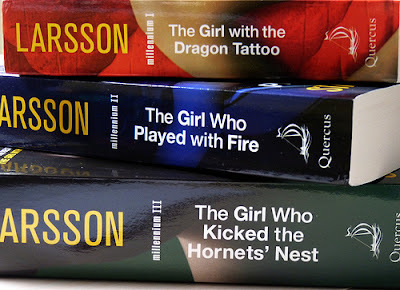 Rita, have you started the Stieg Larsson books yet? The first two are great. The third won't be available in the States until May. Don't you just love the Kinde?!?! Enjoy time with the teenagers. Really hated to hear about your calf. Good to know you are going for physio as these injuries can be very painful - do hope you are feeling better soon and continue to mend as you sew. ;) Your blog always makes me feel so very grateful that you take time to share your quilting, and being reminded that you lead a life at least as complicated as the rest of us only makes me more grateful. Also, loved the layout in this post. Suggests paper boats afloat on a sunny day. (Versus smiling cats...our wire fox terrier wouldn't countenance smiling cats.) Aren't triangles amazing!